Blueline Bus offers Charter Service to Groups, Schools, Colleges and the Business Community in Chatham-Kent, Windsor/Essex, Sarnia/Lambton and Elgin/Middlesex/London. In addition we offer reasonably priced Bus Trips & Tours to locations of interest throughout Southwestern and South Central Ontario and, of course to the Greater Toronto area. Blueline Bus Services is licensed by the Province of Ontario, through the Ontario Highway Transport Board. The OHTB and the MTO regulate the Industry to ensure that buses provide passengers with safe, reliable transportation. 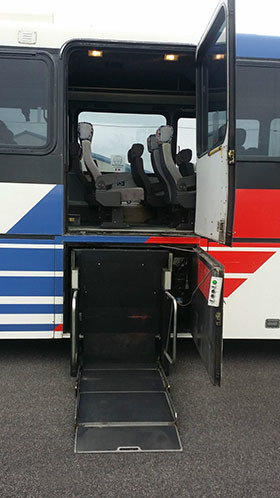 Blueline Buses are safe – in addition to full Annual and Semi Annual safety checks, a motor-coach must have an under-body inspection every 30 days by law, plus a daily ‘Circle Check’ completed by the driver. Blueline bus driver hours are also strictly regulated in the interests of public safety.